One year ago I published my first posts here at Truth in Fiction making today my blogiversary! I haven’t always been a consistent blogger, something I’ll do my best to change this year, but I have enjoyed watching, researching, and writing for this blog. Truth in Fiction doesn’t fit neatly into one category. I’m not solely a film or book blogger and although I enjoy writing the Historical Tourist feature, I don’t travel enough to devote an entire blog to it. So when I decided to mark one year of blogging by looking back on the most popular posts of the year, as measured by the number of page views recorded by WordPress, I was pleased to find that the posts covered a variety of categories. The leader in page views benefits from an attention-grabbing title as well as curiosity about the subject. Wellington’s Boots was written after I spotted a pair of the Iron Duke’s creation, while visiting his former residence of Walmer Castle. The display also included Wellington’s 1839 letter to his shoemaker instructing how a pair of boots should be made. So far 423 people have learned the history behind these enduring boots! 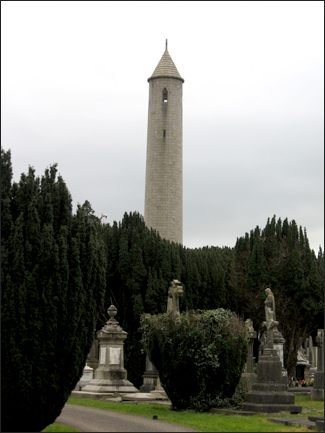 When I visited Ireland’s Glasnevin Cemetery in 2009, I was surprised by the number of people who arrived for the guided walking tour. I assumed the cemetery in North Dublin would be off the beaten tourist track but it has been both a popular tourist destination and a popular post. Over the past year 239 people have viewed The Historical Tourist visits Glasnevin Cemetery and “glasnevin cemetery”, “www.glasnevintrust.ie”, and “glasnevin heritage centre” have all been used multiple times as search engine terms. I’m glad to see that this important historical place remains a popular choice. My review of The Young Victoria is the most popular movie post on Truth in Fiction and ranks number three overall. Written as part of a Victoria Day-themed series of posts, The Young Victoria has been visited 226 times. Many of the visitors have been searching for whether parts of the film were true or false and among the search engine terms used to find the post, which I have left to their original wording and spelling, are: “the young victoria was albert shot?”, “why did the young victoria have to escorted on the stairs?”, “what did Melbourne advice young victoria to do that upset the people!”, and “young victoria king’s birthday speech”. Hopefully my review of the film was able to answer all of their questions! Rounding out the top five are two very different book reviews. I raved about Morgan Llywelyn’s 1916: A Novel of the Irish Rebellion, in a post viewed 175 times so far, praising her meticulously researched fictional re-telling of the Easter Rising and her ability to bring historical figures to life as compelling characters. I was less impressed by Gillian Gill’s joint biography of the Queen and her Prince Consort We Two: Victoria and Albert: Rulers, Partners, Rivals, but the popularity of the film The Young Victoria likely helped generate the 134 views of this post. On this anniversary I’d like to thank everyone who does read Truth in Fiction and especially the fellow blogging members of my family, who can always be relied upon to leave comments and offer encouragement. Hopefully my second year of blogging will continue to be as informative and fun as the first! Happy blogoversary! I’ve really enjoyed reading all your posts – history has been a lot more interesting since I didn’t have to learn it for school! 😉 Looking forward to another interesting year! Thanks Seabrooke! I’m sure its a lot more fun when the memorization is taken out! Happy blogiversary! I have enjoyed all of your posts and look forward to lots more. They’re very well written, informative and appealing even to those of us who wouldn’t search out history books to read ourselves. Chelsea, congrats on a year of interesting posts! Looking forward to hearing more from you!